We're happy to invite our DC readers to attend a free advance screening of Blindspotting, the powerful new film from stars and co-writers Daveed Diggs and Rafael Casal. SYNOPSIS: Collin (Daveed Diggs) must make it through his final three days of probation for a chance at a new beginning. He works alongside his troublemaking childhood best friend, Miles (Rafael Casal) as movers forced to watch their old neighborhood become a trendy spot in the rapidly gentrifying Bay Area. When a life-altering event causes Collin to miss his mandatory curfew, the two men struggle to maintain their friendship as the changing social landscape exposes their differences. Lifelong friends Daveed Diggs and Rafael Casal co-wrote and star in this timely and wildly entertaining story about friendship and the intersection of race and class set against the backdrop of Oakland. 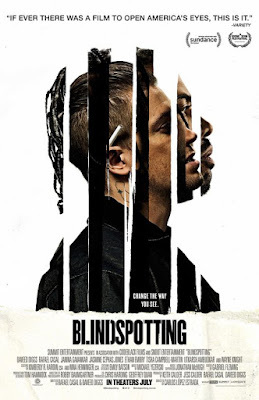 Bursting with energy, style and humor, Blindspotting, boldly directed by Carlos López Estrada in his feature film debut, is a provocative hometown love letter that glistens with humanity. The screening takes place on Tuesday, July 17th at 7:00pm at Regal Majestic in Silver Spring. If you'd like to attend, simply download a pass at the Liongsgate ticketing site here. Please remember all screenings are first come first served and you will need to arrive early to ensure receiving a seat. Enjoy the show!